"These leaves are delicious! Yummy. I could eat a million of them. In fact, I think I will!" Tabansi said. 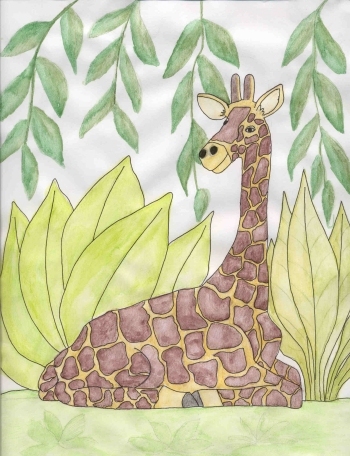 He raised his head and his long neck reached up to the tallest branches of the tree. He bit off a few branches and then sat down on the roots of the tree. "Tabansi, giraffes are supposed to stand up and eat. Why are you sitting down?" Zina asked. A few other ants came and stood next to her. "I’m tired of standing all the time. I want to sit down and gobble up all these leaves. They are delicious!" 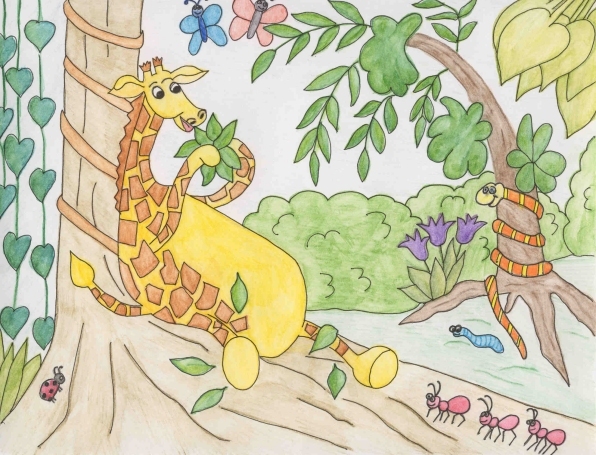 the giraffe said, shoving more leaves in his mouth. Tabansi looked at the trunk of the tree across from him. "Hello Safiya. You’re all coiled around that tree. Shouldn’t snakes be slithering under the leaves or hiding under a rock or something?" the giraffe asked. "Hiss. If you don’t quit eating all those leaves, you’re going to get fat. Hiss." "Don’t be silly. They’re just leaves. I can’t get fat from eating them." Tabansi ate all the leaves off the branches. Though it was difficult, he stood up and pulled a few more branches down and sat back down. It didn’t take him long to finish them off. Each time he stood up, it was more difficult than the time before. "You’re getting fat, Tabansi," Zina warned. "Hiss. Very fat," Safiya said. Tabansi ignored his friends and ate every leaf he could find. "These are so delicious," he mumbled, wiping bits of leaves off his face. Finally, after several hours, the giraffe was full. "Oh, I’m so full." "Look at your tummy," Zina said. "You’re fat now." Tabansi looked down at his yellow belly. He patted it with his hoof. "I’m not fat. I’m pleasingly plump," he said. "Now I’m feeling rather thirsty. I think I’ll go down to the river and have a drink." But when the giraffe tried to stand up, he couldn’t move. "What’s the matter? Hiss. Too fat to get up?" the snake hissed again. "Of course not. I’m just stuck because I’ve been sitting for too long," Tabansi argued. "I think you can’t get up because your belly is full of leaves," Zina said. "I’ll show you all. I’m not too fat. Just watch," he said. He rolled on his side and tried to get up, but he couldn’t. He rolled to the other side and tried to stand, but he still couldn’t. He leaned forward and then leaned backward, but no matter what he tried, Tabansi couldn’t stand up. "I think I’m stuck," he finally admitted. "I guess I ate too much! Can you help me?" "How can a few ants and a snake help a big giraffe to stand up? I’m afraid you’re going to have to stay there all night long," Zina said. She and the other ants wandered away into the bushes. "I hope a lion doesn’t come by and find you lying here, especially a hungry lion," the snake teased and slithered down the tree into the bushes. All night long Tabansi had to sit slouched against the tree. His tummy hurt from eating too much. He heard owls hooting and monkeys chattering and all sorts of strange noises that frightened him. There would be no sleep for Tabansi tonight! In the morning the ants came by to see how the giraffe was doing. Tabansi looked tired and frightened. "I see you didn’t get eaten by a lion," Zina laughed. The other ants started giggling too. "Can you get up?" Tabansi yawned. He rolled onto his side and started to stand up. After a lot of struggling and moaning and groaning he found himself on his four hooves. "I did it! I stood up!" He was so happy. "I’m never going to eat that much again and I’m never going to sit down when I eat. From now on, it’s standing up for me." That day Tabansi didn’t eat very much. He spent the day walking around, enjoying the treetops. When he heard the lions roaring later on in the day, he was glad that they hadn’t come by the night before when he’d been stuck on his back!